Time has been a slippery customer of late, but aside from the weekend photo teaching gigs there has been the odd escape to seek out winter. Sometimes that has coincided with a weather window, but mostly not. 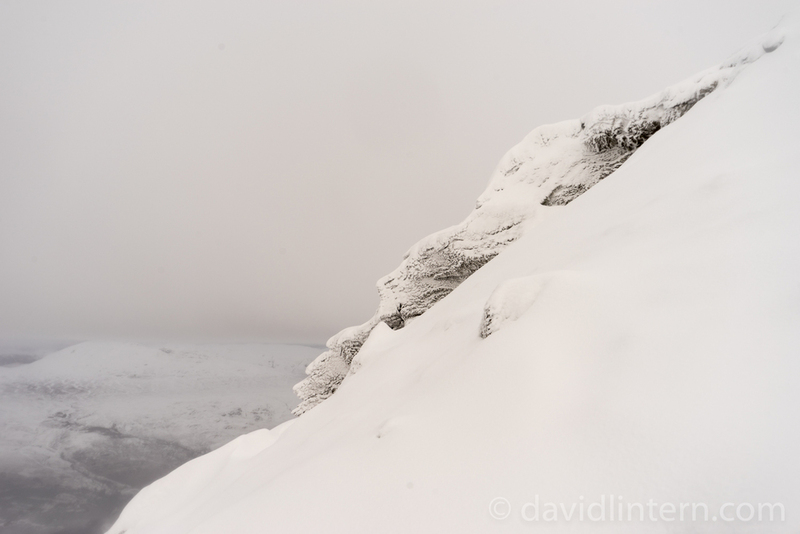 2 weeks ago I went out expecting blue skies, got to the north of Loch Lomond and hit a wall of cloud. I went up and over Ben More anyway, and not just for the tick. I'm working on a series of pictures which is sort of about the secret life of mountains - what happens there when there is no one there to witness... and sort of about what happens to landscape photography when there's no landscape (or at least very little) to photograph. I really enjoyed the white out - surreal, disconcerting, even calm after a fashion... and the sun did set in a sort of pink champagne burp, somewhere out there. It was also worth it for the exercise - there's been way too much time sat at a desk recently. 2 days after, we chanced our arm on the Ballachulish horseshoe... and then retreated along with a half dozen other groups, in high winds and with windslab forming almost as we passed. I realised afterwards we'd taken completely the wrong approach. Still, a fine day to be out - Scotland looking its cold, brutal best - and we'll head back, hopefully before the season is out. Less than a week later, I dropped an image into an exhibition in Fort William, and dossed down in Glen Etive before meeting Mick again for another hill. I'm only just beginning to scratch the surface here, and it's wonderful - venture away from the road for even 15minutes and there's untold magic to be found. I only just got the car out of the glen the following morning, and conditions were mean as hell on the hill, but it was a good test of navigation and not even our pride was hurt this time round. Those photo teaching weekends went well, and I've decided to run these as and when people want them, on a 1:1 basis. If you fancy improving your outdoor photography in the most beautiful country in the world, do take a look at the tuition page and give me a shout with your dates.